Senate Bill 8 is an omnibus anti-abortion bill that Governor Abbott signed on June 6, and it goes into effect September 2017. SB 8 furthers the stigma around abortion. This bill requires unnecessary restrictions and puts forward the false notion that abortion care medicine, including the people who provide abortions and the women who need them, require onerous monitoring and regulatory interference by the state. SB8 bans D&E (dilation and evacuation) procedures used in abortion care – it is one of the safest and most common outpatient procedures; bans the donation of fetal and embryonic tissue for medical research; requires monthly reporting, as opposed to the current yearly reporting requirement for abortion statistics – this adds unnecessary administrative burdens on physicians; and requires fetal and embryonic tissue to be buried and cremated by medical providers. At Whole Woman’s Health, we have a history of fighting back for our patients and their right to safe, legal abortions. Our supreme court victory last summer in the Whole Woman’s Health v. Hellerstedt case gives us a strong ground to stand on in Texas and across the country. What we continue to see over and over again is that overzealous politicians continue to play with women’s lives and this has to stop. Texans deserve better. Just four days after our historic Whole Woman’s Health v. Hellerstedt win, the Department of State and Health Services tried to pass a fetal cremation administrative rule that would further stigmatize abortion and served as a clear defiance of the Supreme Court’s decision in our case. In January 2017, we sued the state of Texas over the Department of State and Health Services regulations that required the burial or cremation of fetal and embryonic tissue, just like in SB8. Attorney General Ken Paxton appealed the lower court’s stay to the 5th Circuit. As always Whole Woman’s Health will lead Texas in providing high quality abortion care services across the state, and in challenging bad laws that harm women whenever we need to. Texans deserve the dignity to make their own healthcare decisions and this includes access to safe, legal and compassionate abortion care. 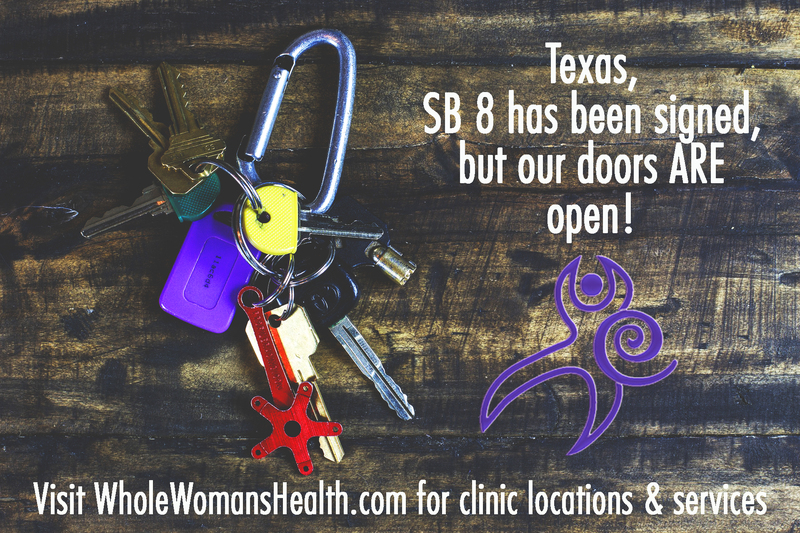 Despite the passing of SB8 and the potential litigation that may follow, we want to let Texans know that abortion is still legal in Texas, up to 20 weeks and that Whole Woman’s Health is still providing safe, compassionate abortion care services in our McAllen, Fort Worth, Austin and San Antonio clinics. The signing of the law does not make any immediate changes. If you have an appointment for an abortion or are needing one, know that nothing has changed yet. If you have any questions regarding your appointment, feel free to call our EmpowerLine at 877-835-1090. Even though this law is scheduled to go into effect in a few months, we will not sit idly by and are committed to fighting all laws that strip women from making personal healthcare decisions. We will continue to advocate for our patients and educate our communities about these laws and how they negatively impact Texans. Can we donate to your legal fund? …And we thank you always for your support, in action and in solidarity.